Outstanding American Indian Art Auction at Skinner | Skinner Inc.
“Van Kirke Nelson was a USC college student working as a camp counselor on the shores of Flathead Lake when he discovered the West—its wildness, its history, and its people. Over the next seven decades, he and his wife Helen undertook a serious lifelong study of the diverse cultures and histories represented by the art, artifacts and Americana they collected. In their pursuit of these beautiful objects, the Nelsons were inspired by fellow collectors: artist Paul Dyke; dealer and historian Rex Arrowsmith; Mary and Carl Schlosser of Taos, New Mexico; artist John Clark of East Glacier; Bob Scriver of Browning, Montana; Nick Eggenhoffer of Cody, Wyoming; and Father Schoenberg of Gonzaga University. Plains clothing is well represented in the sale. Highlights in a strong group of women’s dresses include a fine Sioux Blue Trade Cloth Dress with Dentalium Shell Decoration (Lot 130, Estimated between $6,000 and $8,000), and a rare Southern Cheyenne Beaded Hide Woman’s Dress (Lot 133, $10,000-$15,000). 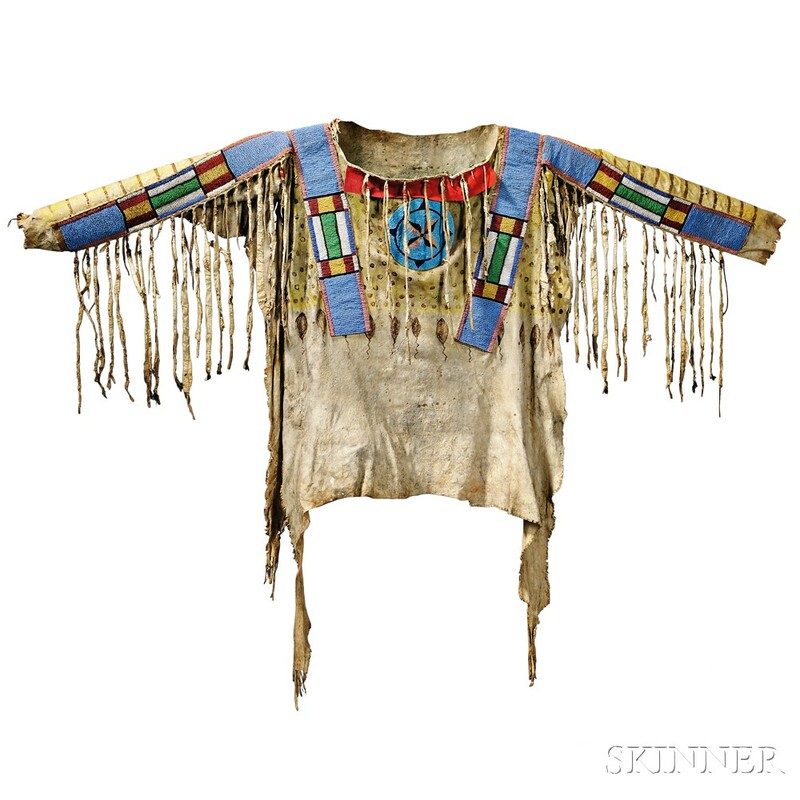 Of particular note in a fine collection of men’s clothing items are a Blackfoot Beaded and Painted Antelope Hide Shirt, previously in The John S. MacKay Collection (Lot 131, $125,000-$175,000); an unusual Pictographic Central Plains Beaded Hide Man’s Shirt (Lot 134, $30,000-$40,000); and a Lakota Pictorial Beaded Hide Vest (Lot 87, $15,000-$20,000). The Nelsons loved moccasins, and there are several fine and colorful pairs in this auction. Of special note are a Pair of Ute Woman’s High-top Moccasins (Lots 60, $4,000-$6,000); a Pair of Fully Beaded Lakota Man’s Moccasins (Lot 64, $3,000-$4,000); and a Pair of Plateau Pictorial Beaded Hide Moccasins (Lot 66, $4,000-$6,000). A Northern Plains Beaded Horsehair Necklace (Lot 17, $400-$600); a Sioux Woman’s Hairpipe Necklace (Lot 19, $1,500-$2,000); and two beautiful Loop Necklaces, (Lot 20 and Lot 21, $2,500-$3,500 and $2,000-$2,500 respectively) are standouts among the body adornments in the collection. The collection encompasses a wide range of pouches and bags, including mirror bags, belt pouches and pipe bags. 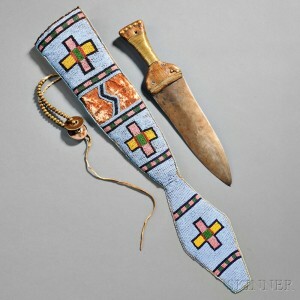 Two items of particular interest are Lot 143, a Lakota Beaded and Quilled Pipe Bag with Wood Tamper ($4,000-$6,000) and Lot 145, a Cheyenne Beaded and Quilled Hide Pipe Bag ($5,000-$7,000). A small group of Parfleches is highlighted by the Large Lakota Polychrome Parfleche War Bonnet Case (Lot 123, $5,000-$7,000). Several fine examples of Plains weaponry in the sale include a classic Crow Beaded Buffalo Hide Rifle Scabbard, previously in The John S. MacKay Collection (Lot 152, $15,000-$20,000); a Plains Pipe Tomahawk previously in the collection of Philip and Linda Curry (Lot 153, $4,000-$6,000); an early Plains Buffalo Hide Bowcase and Quiver (Lot 155, $6,000-$8,000); and an exceptional Large Blackfoot Beaded Buffalo Hide Knife Sheath and Double-edged Dag Knife from The C.P. Carberry Collection of Glacier National Park Indian Clothes and Relics (Lot 156, $25,000-$35,000). Among the equestrian items in the sale are a rare Plains Child’s Saddle (Lot 158, $4,000-$6,000); a lot of Three Blackfoot Horse Regalia Items (Lot 159, $5,000-$7,000); a Crow Bridle with Beaded Ornament (Lot 160, $4,000-$6,000); and a Crow Woman’s Saddle and Stirrups (Lot 161, $4,000-$6,000). A Rare Lakota Red Trade Cloth Cradle (Lot 104, $3,000-$4,000) and an exceptional Crow Beaded Model Cradle (Lot 106, $15,000-$20,000) are standouts in an impressive group of cradles. Other items of particular interest to collectors include a 19th Century Blackfoot Trade Blanket with Beaded Hide Strip (Lot 103, $15,000-20,000); a Plains Grizzly Bear Claw Amulet (Lot 24, $1,000-$1,500); and an unusual Plains or Apache Flute made from a Rifle-Musket Barrel (Lot 165, $300-$400). Previews for the auctions are free and open to the public. Previews will be held in Boston on Thursday, February 4 from 12PM to 5PM; on Friday, February 5 from 12PM to 7PM; and on Saturday, February 6 from 8AM to 9:30AM. The illustrated catalog for Sale 2879B is available from the Subscriptions Department at 508-970-3240 or from the Gallery. Prices realized will be available online at www.skinnerinc.com during and after the sale. The Skinner website also enables users to view all lots in the auction, leave bids, order catalogs and bid live, in real-time through SkinnerLive! Skinner auctions draw international interest from buyers and consignors alike, with material regularly achieving record prices. The company’s auction and appraisal services focus on fine art, jewelry, furniture, and decorative arts from around the globe, as well as wine, fine musical instruments, rare books, Asian art, clocks, and more. Monthly Skinner Discovery auctions feature a breadth of estate material. Widely regarded as one of the most trusted names in the business, Skinner appraisers have appeared on the PBS-TV series, Antiques Roadshow, since the show’s inception. Skinner has galleries in Boston and Marlborough, Massachusetts, as well as in New York City and Miami, Florida, with bidders participating in person, by phone, and online. Join auctions live with SkinnerLive! and Bidsquare. For more information and to read our blog, visit the website at www.skinnerinc.com, find us on Facebook, or follow us on Twitter or Instagram. 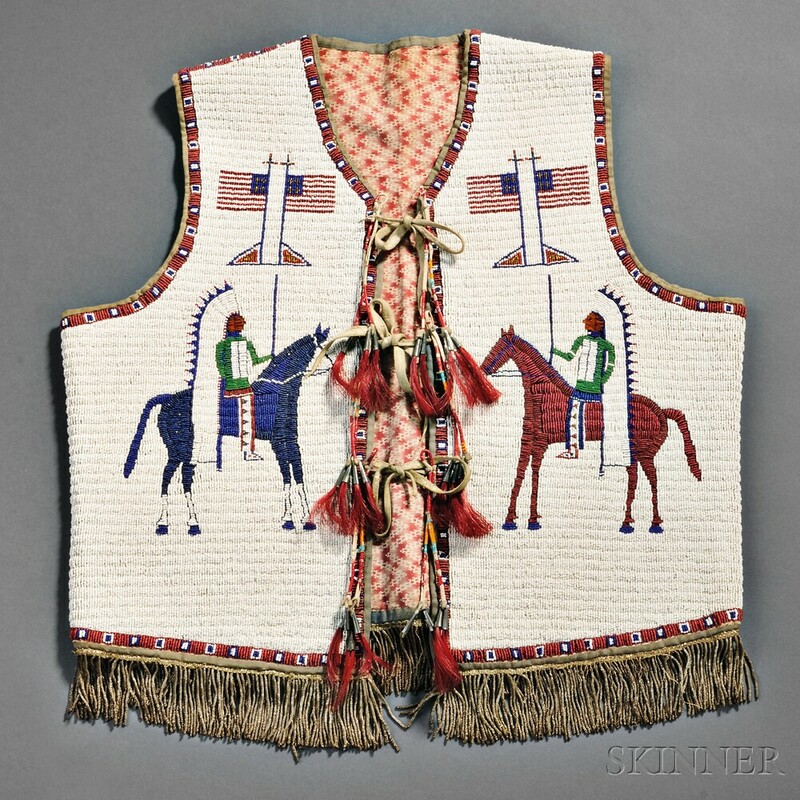 This entry was posted in News and tagged American Indian, arrowhead, auction, basket, beadwork, Blackfoot, boston, Cheyenne, Crow, ethnographic, Hunkpapa Sioux, jewelry, Lakota, mask, moccasins, Montana, native american, northeast, northwest, pipe bag, Plains Indian, Plateau Indian, prehistoric, saddle bag, shield, skinner auctions, southeast, southwest, textiles, tribal art, tribal weapons, Van Kirke Nelson by Skinner. Bookmark the permalink.